DOP money remittance is a mobile application that enables us with immediate money transfer from one place to another place using mobile, through Indian post offices. The process for money transfer is very simple to understand and follow. For this initiative, India's oldest and largest communication service provider (CSP), BSNL will provide mobile connections to DOP’s designated officials and BSNL will bring Global technology for Mobile Money Transfer.Currently this service is available in limited state under few Post Office.to check the availablity of the service in your post office just visit http://dopmobile.in and search using your state with PIN code or Post office name. DOP Mobile Money Transfer is a service that enables instant money transfer from one place to another place using mobile, through Indian post offices. 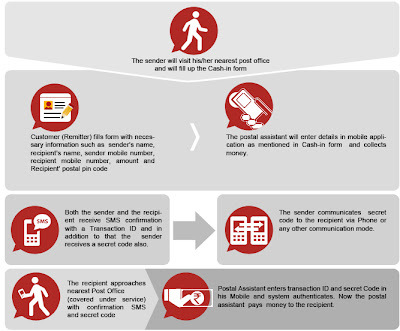 The consumer just needs to have a mobile while the actual transmission of the money is initiated by the Postal Assistant, using his/her special handset. The process for money transfer is very simple to understand and follow. 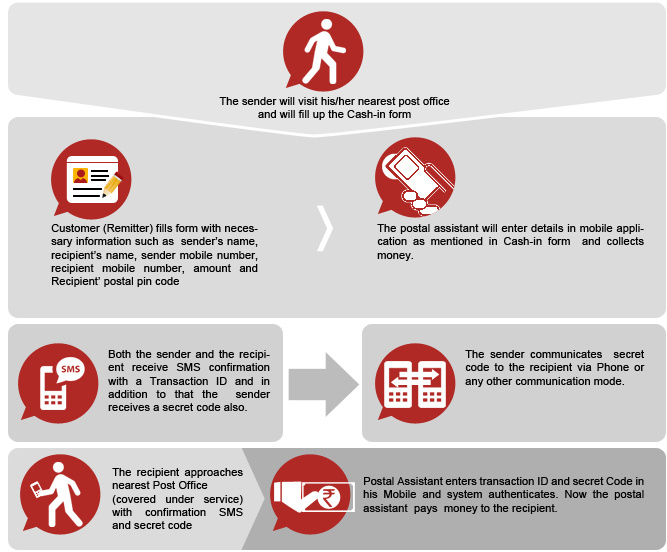 The remitter (sender) can submit money (Cash In) at any of the covered post office and automatically, the amount is transferred to a central position, which can be collected by recipient customer (Cash Out) from any of the covered Post offices. As soon as the Cash in happens, both the sender and the recipient get a SMS on their mobile phones. The sender gets a Transaction ID and a Six (6) digit secret code in the SMS while the Recipient only gets the Transaction ID. Recipient can claim the money from any of the covered Post Offices by showing the Transaction ID that he receives on his mobile in the SMS and the Secret code, which he gets from the sender. In order to make process smooth and convenient, a notification sms is being sent to remitter as well as to recipient regarding transaction irrespective of their telecom operator. For this initiative, India's pioneer and largest communication service provider (CSP), BSNL will provide mobile connections to DOP’s designated officials and BSNL will bring Global technology for Mobile Money Transfer. Each Post office shall be provided with a mobile handset with pre loaded application by BSNL’s technology partner M/s Maverick Mobile Solutions. 1) As soon as the recipient receives a notification sms with transaction Id and secret code from the sender, he/she can collect money at destination post office. 3) No limit on the number of transactions. However the minimum amount is 1,000 rupees while the maximum is 10,000 rupees. 4) The sender must inform to the Cash In postal assistant regarding this so that he/ she will resend the same. 5) The recipient must collect money within 14 days of transaction. 6)In case the recipient does not Cash Out the amount within 14 days, the amount is sent back to the sender and a ‘Cash In reversal’ SMS with new transaction-id will be sent to remitter. The remitter can withdraw money within 7 days (prescribed) after this SMS.